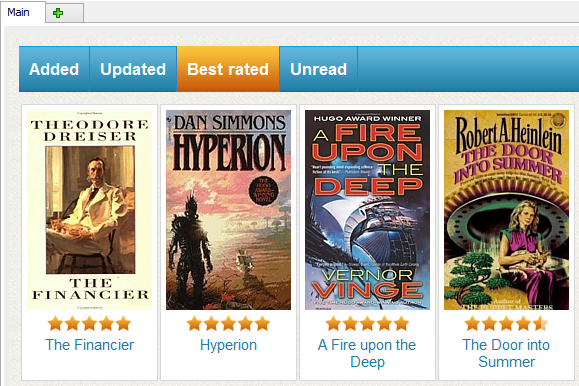 Downloaded ratings (2) are displayed directly under the corresponding site's logo (in our example it's Amazon). Some sites do not have any ratings, so if you download information about books from such site, there will be no downloaded rating. Your own rating is represented by 5 stars (1). Each star includes two points, so it's 10 points in total. The screenshot above shows a rating of 8 (there are 4 bright stars and 1 faded star). 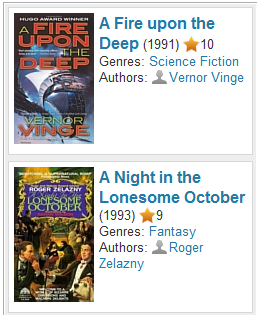 You can rate a book by clicking the stars under its cover image. 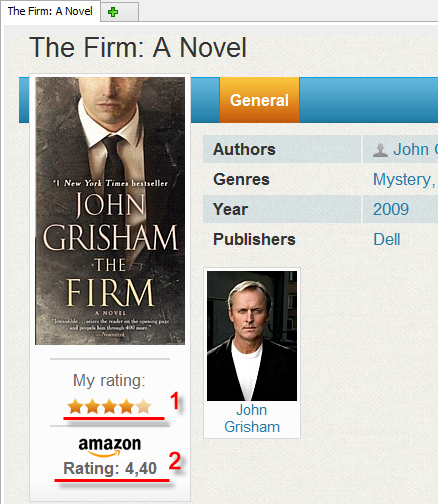 For example, clicking the left half of the leftmost star will assign the book a rating of 1. If you click on the right half of the same star, the rating will be set to 2. 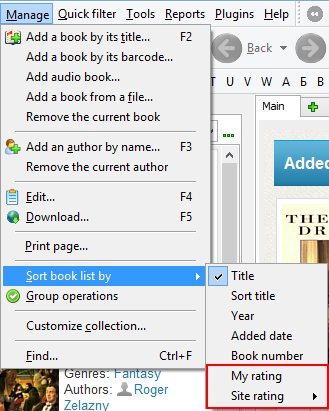 If you select a value here, all books rated so or better will be displayed, the rest will be hidden. To disable the filter, just click the star button (but not the arrow) again. Find the "Show user rating" and "Show site ratings" options in the "Book page settings" area. Remove the checkmarks, if you do want to see any ratings. You will still be able to set and see your own rating in the "Edit info" window, but no stars will be shown on the book page, in the list, on the home page, etc. Ratings help you find and select best books of your home library.